We’re not there yet... We need to generate about 200,000 jobs a month nationally to get that unemployment rate to come down. Economists predicted that the Labor Department report would indicate that 70,000 jobs had been lost. However, the disappointing report revealed that 131,000 jobs were lost in July. This is partially due to the fact that the federal government lost an estimated 143,000 temporary Census workers. As a result, many of these temporary Census workers are back on the harsh job market. Since June, the number of discouraged workers has remained the same at 1.2 million. These are workers that have given up searching for employment and are not counted in the official unemployment rate. How many more times do families and small businesses have to ask 'where are the jobs' before President Obama changes course? Clearly, the Obama administration’s flawed efforts to increase job growth are failing by their own measure. History has proven that increasing government spending will not stimulate the economy. 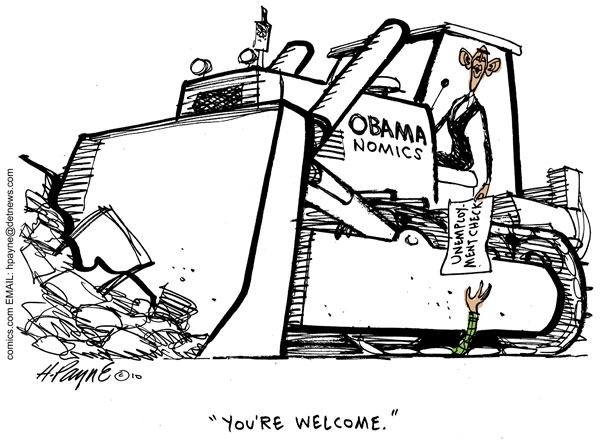 As the comic below shows, Obamanomics has destroyed jobs while increasing Americans dependence on government payouts. It’s time to change course by cutting job-killing taxes and harmful regulations that force Americans to rely on unemployment benefits for their source of income.